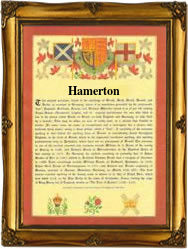 Recorded in the spellings of Hamerton and Hammerton, this is a truly ancient English surname whose origins are well documented. It is locational, and usually from the villages of Hamerton, near Huntingdon, and Kirk and Green Hammerton which adjoin each other on the Vale of York, and within sight of the famous York Minster. All the villages contain ancient manor houses, the lord of the manor of the Yorkshire villages, Lawrence Hamerton, being recorded both in Jenyn's roll of heraldry in the year 1308, and the roll of the battle of Boroughbridge in 1322. These rolls, amongst the earliest surviving records of the English nobility, are from the time of King Edward 11nd of England 1307 - 1327. The place names according to Ekwall's 'Dictionary of English Place Names' mean 'the village on the rock', from the pre 7th century word 'hamor', a rocky mound. This description may loosely apply to Green Hammerton, which is on a slight escarpment, but both the Huntingdon Hamerton and Kirk Hammerton are on level ground. This suggests that the derivation was from 'hamm', which means 'flat'. The Yorkshire villages were recorded respectively as "Hamereton" in the 1086 Domesday Book, and as "Grenhamerton" in the 1176 Pipe Rolls of that county, and the Huntingdonshire village as "Hambertune", also in the 1086 Domesday Book. Earlt examples of the surname recording include: Johannes de Hamyrton, and Johannes de Hamerton in the 1379 Poll Tax Returns for Yorkshire, whilst William Hamerton was recorded at the church of All Saints, York, on January 2nd 1555. The coat of arms granted to the family depicts three black battle hammers on a silver shield, the crest being a hand holding a broken hammer proper. The first recorded spelling of the family name is believed to be that of Geoffrey de Hamertone. This was dated 1273, in the "Hundred Rolls" of the county of Huntingdonshire, during the reign of King Edward 1, known as "The Hammer of the Scots", 1272 - 1307. Surnames became necessary when governments introduced personal taxation. In England this was known as Poll Tax.